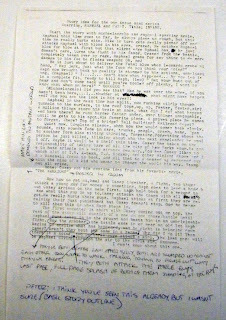 Peter Laird's TMNT blog: Blast from the Past #165: Kevin Eastman's original plot for Raphael "Micro-Series"
Blast from the Past #165: Kevin Eastman's original plot for Raphael "Micro-Series"
I don't have Kevin Eastman's "Artobiography" close at hand to check, but it is possible he may have printed this document in it. Regardless, I thought it was interesting enough to post. I just had to say thanks again for posting all this great info. It's very inspiring. It would have been great if the artobiography was Eastman & Laird's TMNT encyclopedia. But then again, I can't complain that we fans have a great book and a great blog. Best of both worlds. Maybe after a few years you can print all of your blog entries as Peter Laird's TMNT ArtoBlography!!! I just picked up a complete set of the NECA turltes. I think they are the best figures I've purchased in a long time. No let downs at all. From the paint application and articulation (including the tightness of joints) to the choice of a rubbery material for the chest and harder plastics elsewhere. -->> ..and just ' NOW ' it hits me how much " THE WARRIORS " ..reflects on Casey..
jeez .. where the hell i been. I love looking at the original stuff- and I love that you will ost it so we can see it. Sorry-- not paying attention tonight. One of a kind! Act now!!! BUY THIS SHIRT!!! Blast from the Past #160: TMNT birthday card...?